I’ve never made pancakes with blended gluten-free oats before, although I’ve heard that they’re a staple for people who can’t tolerate gluten, but I was quite surprised at how tasty they were. 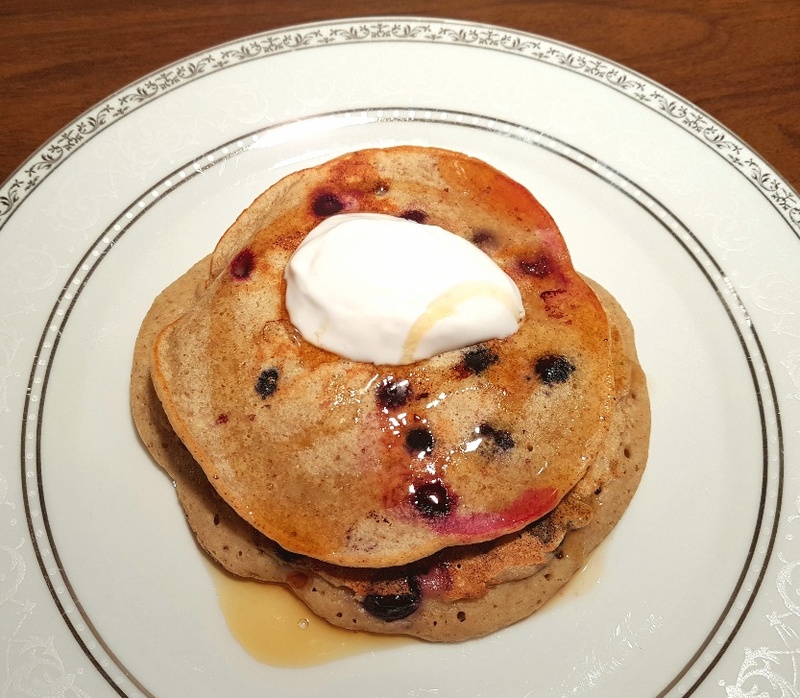 Don’t get me wrong, the texture is very different from normal flour-based pancakes because the oats are a considerably more dense ingredient, but they work quite well overall. These blueberry pancakes are fairly easy to make and although they require 15 minutes at the start of the process to soak the chia seeds, once that’s done all of the ingredients can be thrown into your food processor , blender or Nutribullet and whizzed together to create the batter (with the exception of your blueberries because you want those delicious little bad boys to be kept whole). If you’ve never heard of or used chia seeds before, they’re a tiny little seed which absorbs water really fast and turns into a thick, gel-like consistency, so they’re a really useful ingredient to use if you’re looking for an egg replacement. 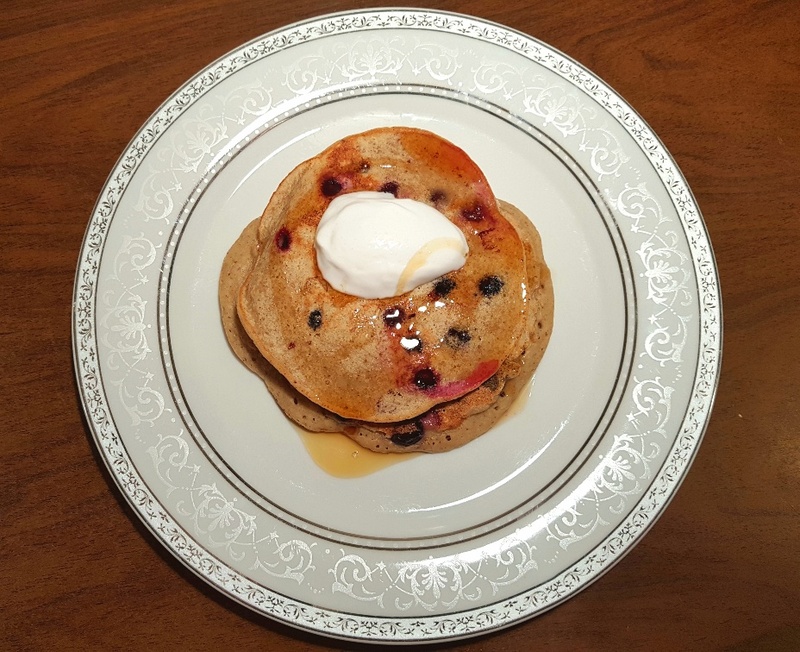 This recipe for blueberry pancakes makes a generous stack of fat blueberry pancakes which are soft in the middle, crisp around the edges, and laden with little blueberry bombs that explode in your mouth, flooding it with their sweet juice. With a description like that how can you possibly resist making them? Put the chia seeds in a mug and cover them with 2 tbsps of water. Leave the water to be absorbed into the chia seeds for at least 15 mins. While you’re waiting for the chia seeds to plump up you can put all of your other ingredients (except the blueberries) into a food processor , Nutribullet or blender and blend it all together. Once the chia seeds are gel-like add them to the mixture and mix again. Pour the mixture into a jug and stir in the blueberries. (I just used my blueberries from frozen and they worked fine). Place a non-stick frying pan over a medium heat and once it’s hot, cook your pancakes. Let your pancake cook on one side for a while before peeking at its underside and if it’s brown then flip it over and cook the other side until it’s brown too. Continue until all of the mixture is used up, keeping the cooked pancakes in the oven on a low heat, and serve with low FODMAP nut butters, maple or golden syrup, fresh fruit, lactose-free whipped cream or whatever low FODMAP options take your fancy.